Stanley spent about 6 hours helping me out in the garden today. 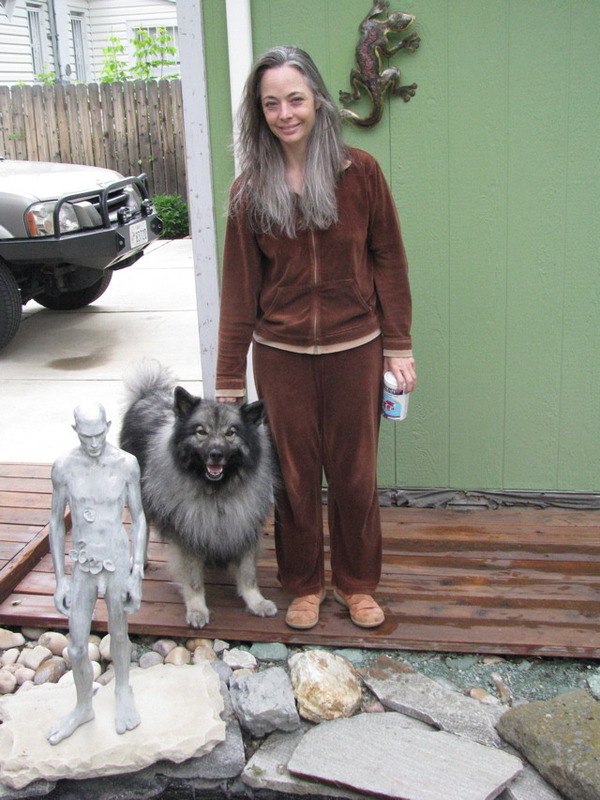 It snowed up in the hills yesterday and rained down here. Today was blustery and cool, a perfect day to move plants around to new stations. 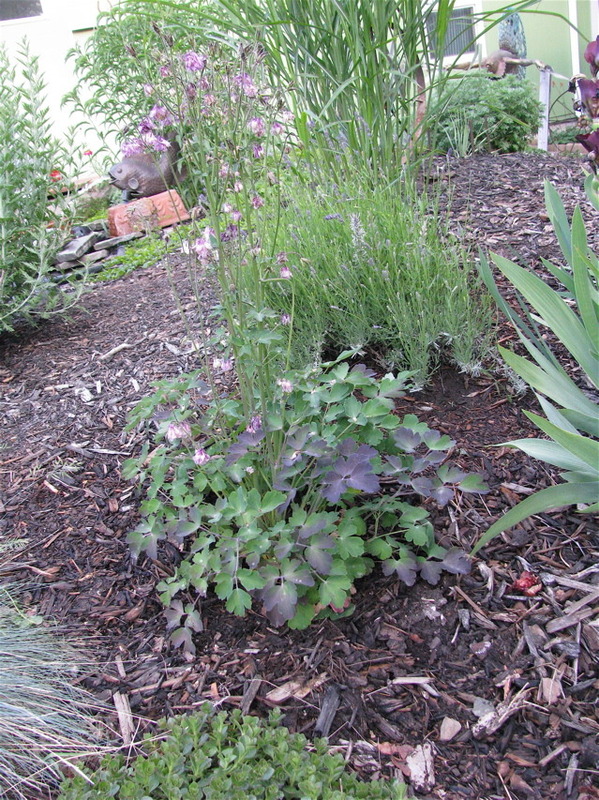 What was supposed to be a simple transfer of a blue Hosta and a pair of Astilbe from the front garden (too sunny later in the year!) 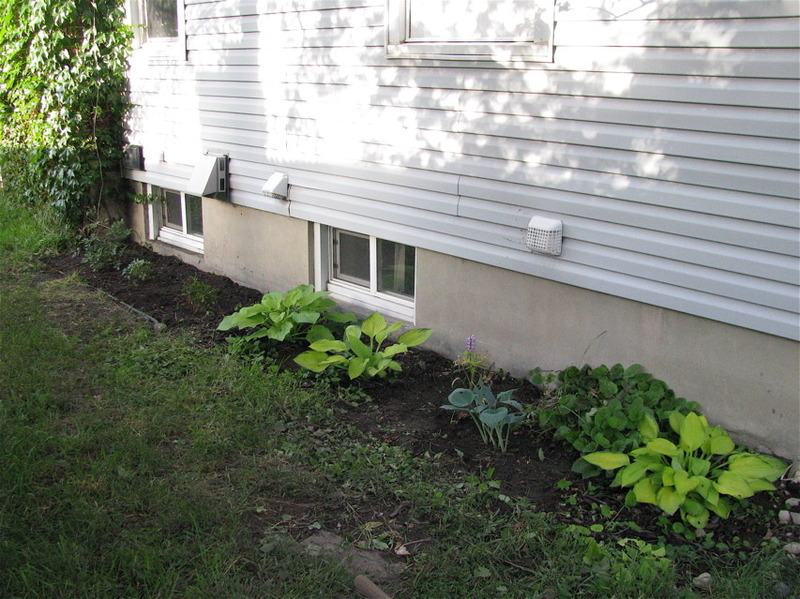 to the shady side of the house, turned into adding another 7 feet of garden along the side of the house complete with edging and turning all the soil and adding in peat and fertilizer. The normal “soil” is a packed clay/sand. So that was the first little thing. 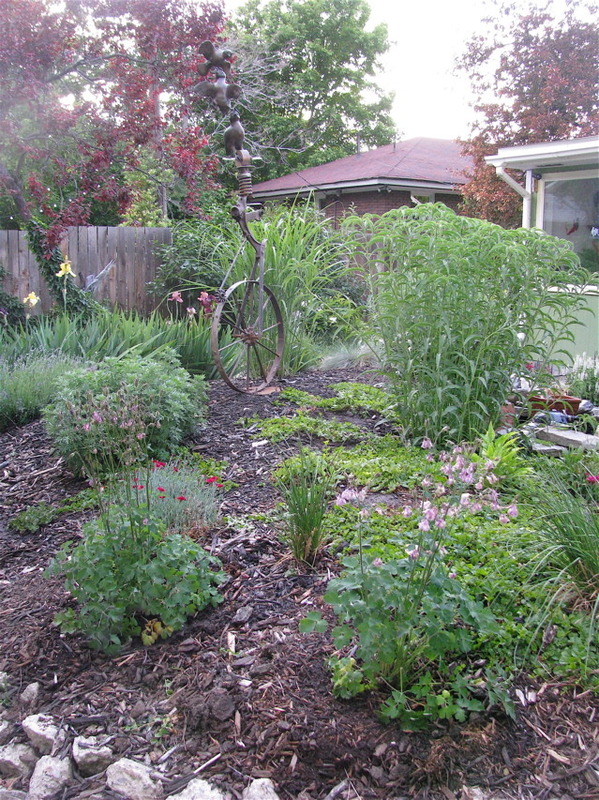 Next: the Maximillion Sunflower at the headwater of the pond has gone nutz and is crowding out three big Pink Barrow Columbine “Bell Flower” hybrids- they were all moved. 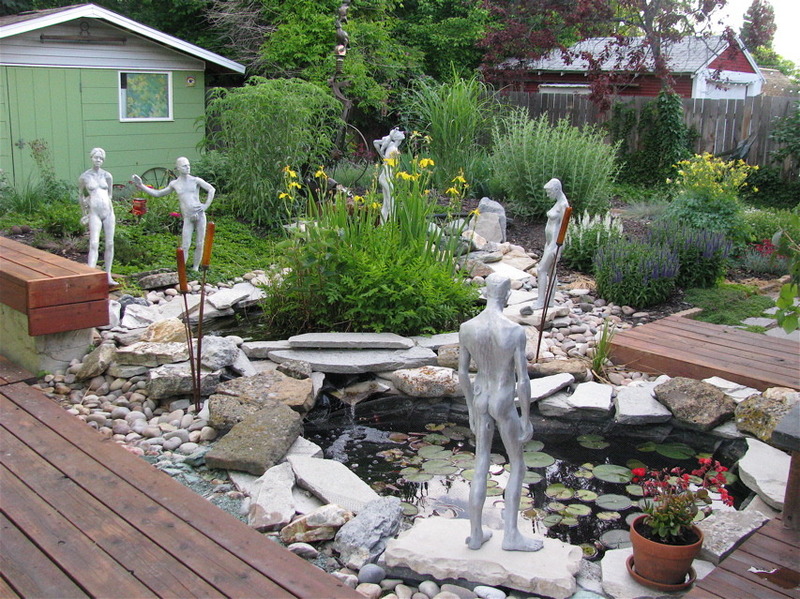 A few other fellows needed moved from overcrowding, or just needing a spot with less sun. 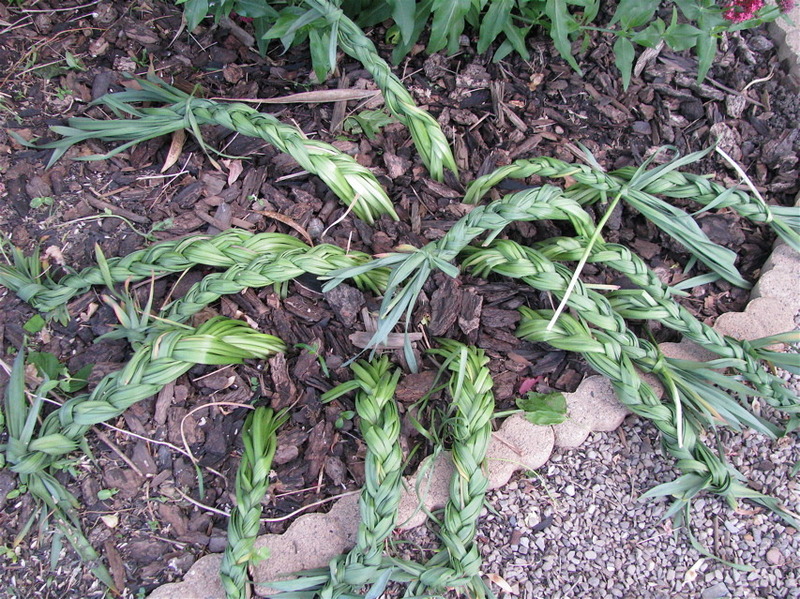 Then the lawn needed mowing, and Elizabeth braided the Daffodil stems. 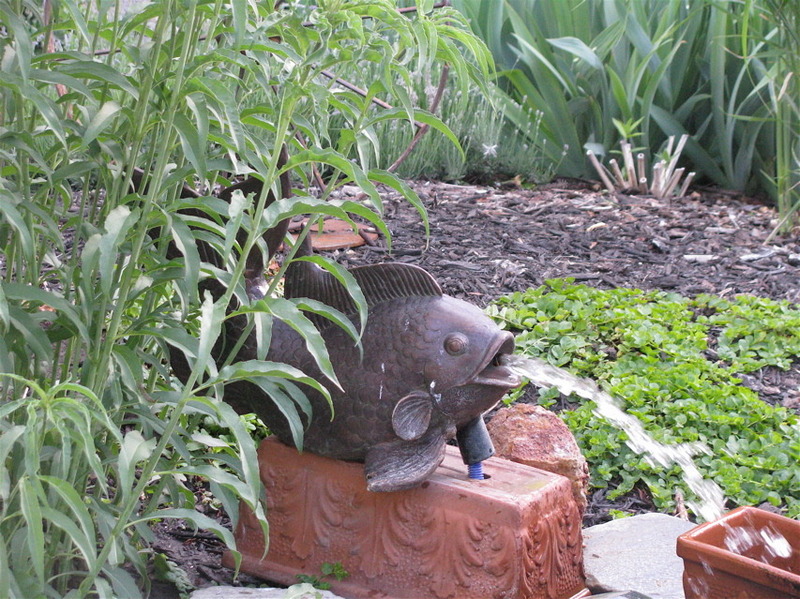 The fish fountain I added awhile back. 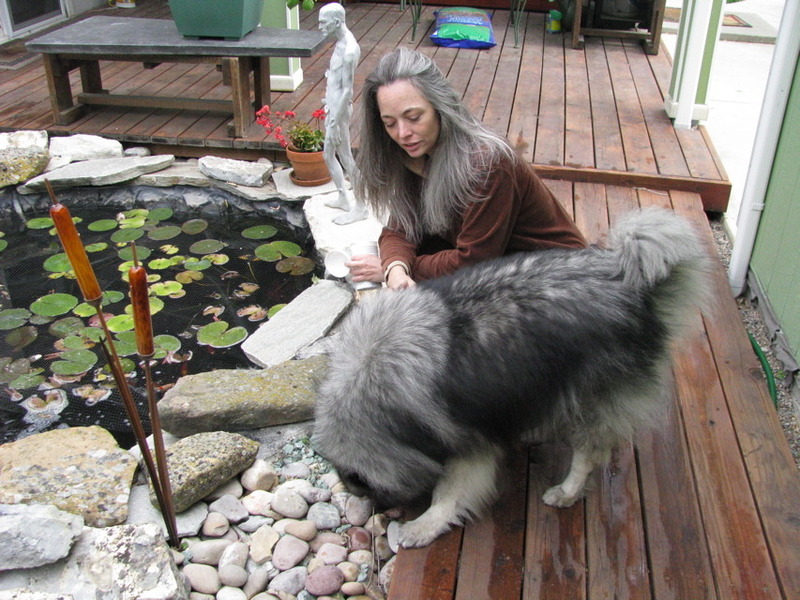 He spews into another planter that I’ve cut holes into the bottom of to adjust the tone of the water hitting the pool below. Fussy, I know. I still have to build him a new fin to hide the piping- he was cheap at Tuesday Mornings bcs his fin was broken off. Welcome Stanley! 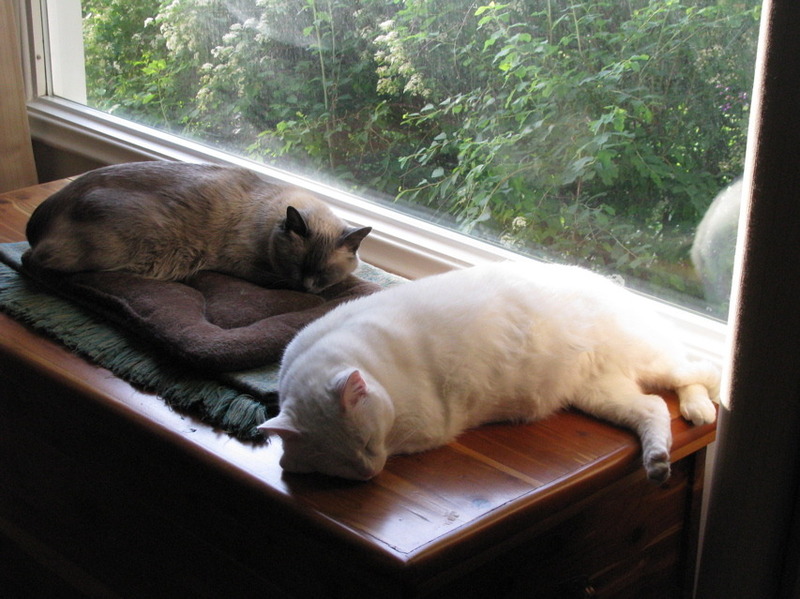 A wonderful super-buddy has joined the menagerie. He is happy that his hair matches Elizabeth’s, and I am already at work creating a Stanlely-weave for myself: at last I will have a full mane of distinguished salt & pepper hair to match Elizabeth. 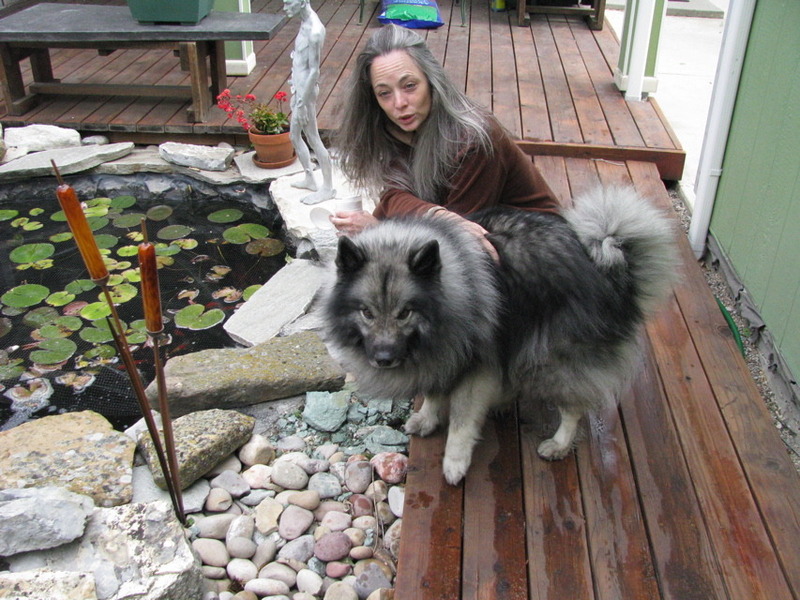 Stanley is a sweet 6-year old fellow, he is fixed, and an AKC registered pure-breed. 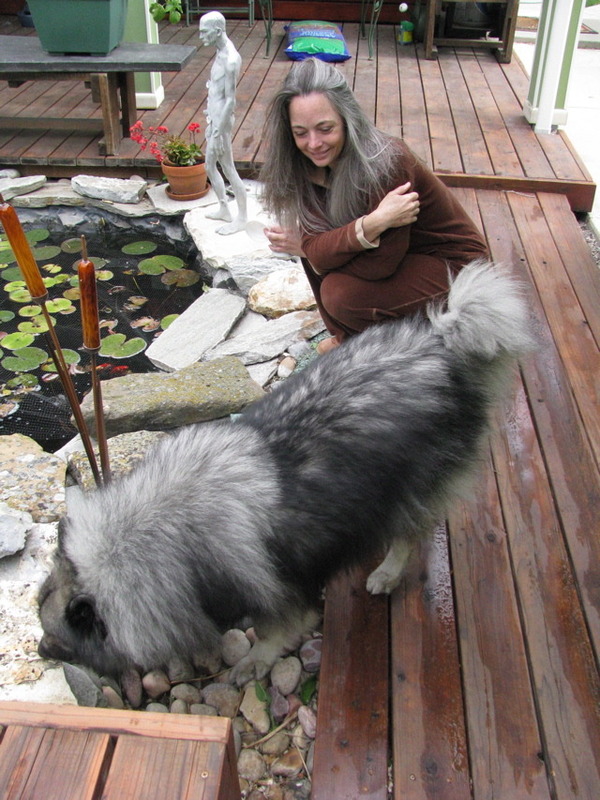 His family divorced and he wound up with his alpha’s parents, now he is adjusting swimmingly to his new people and (gasp) cats. 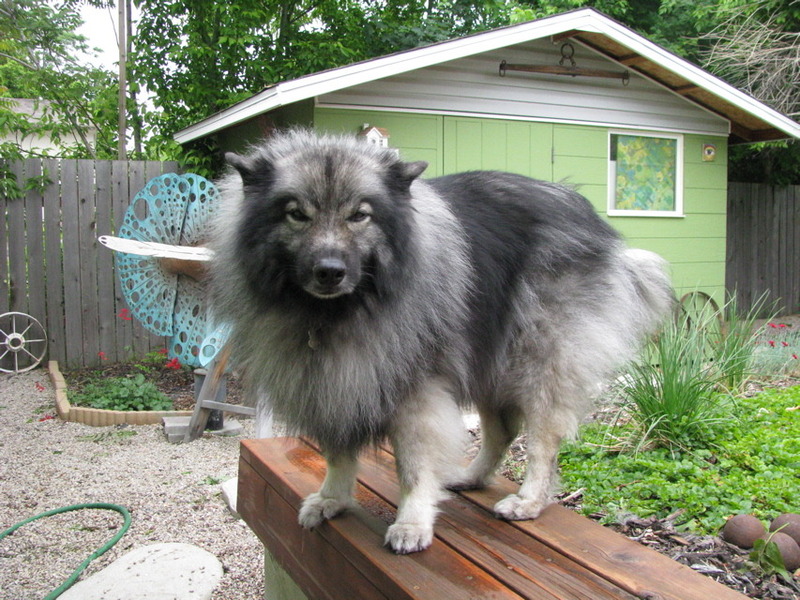 He has never had cats in his space before, and is Keeshond-Curious, which is pretty intense, but the cats are already over it. Keeshonds (keiz-hond(t), meaning “hounds of the Kees”) are a Dutch breed, popular in the 17th Century. These dogs were so highly regarded they were the mascot of the Kees family who were in a civic power struggle with the ruling royal family led by William of Orange (who won The Bloodless Revolution with England and defeated the Kees) . 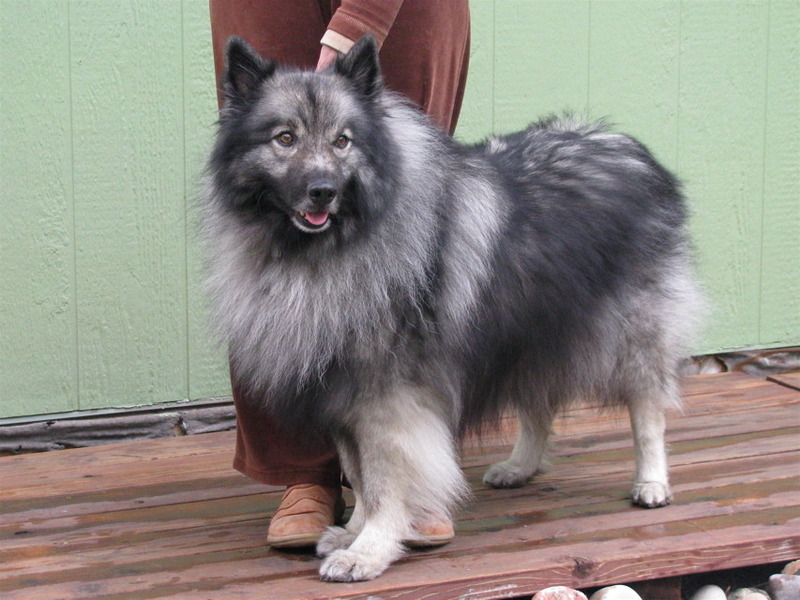 With the Kees thrown down, the Keeshond lost favor as well, isolating the breed to the Netherlands. (artist’s note: 17th Century Dutch art personifies how the scientifically minded, seafairing, humanistic, trade oriented culture outdid the bloody Counter-Reformation of Roman Catholocism, and stands as one of the most important eras in all of art history and Western history, ie Vermeer & Spinoza & fans of The Enlighentment). 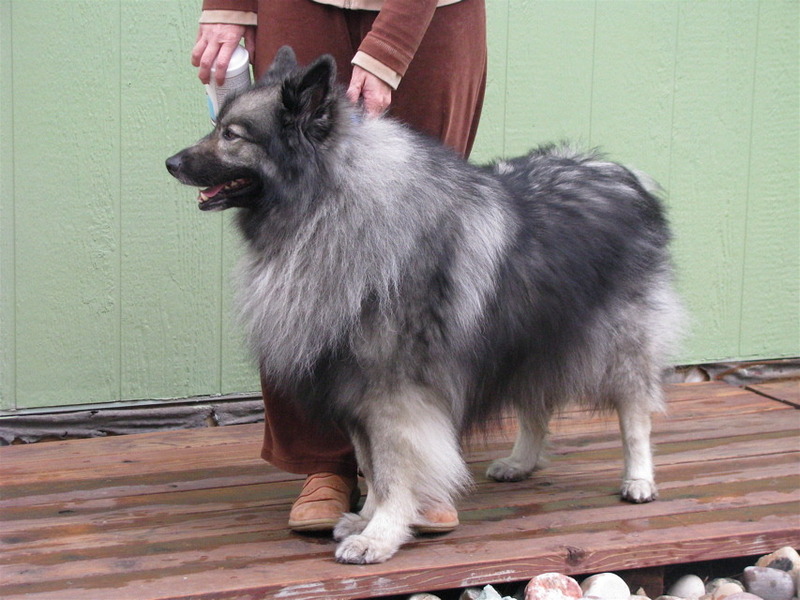 Keeshonds are bred as companion dogs only, and are the only dog in their class with no functional hunting/herding background. 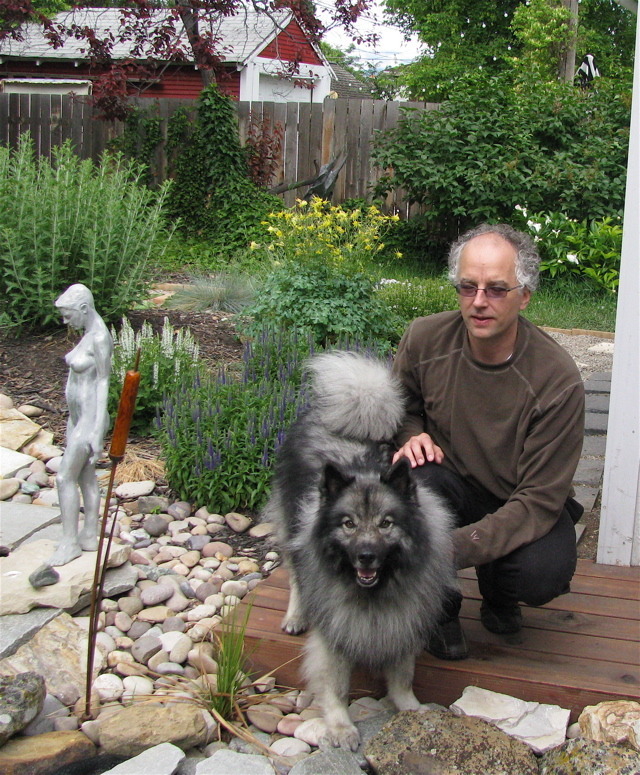 They are one of the more intelligent breeds, and learn quickly. 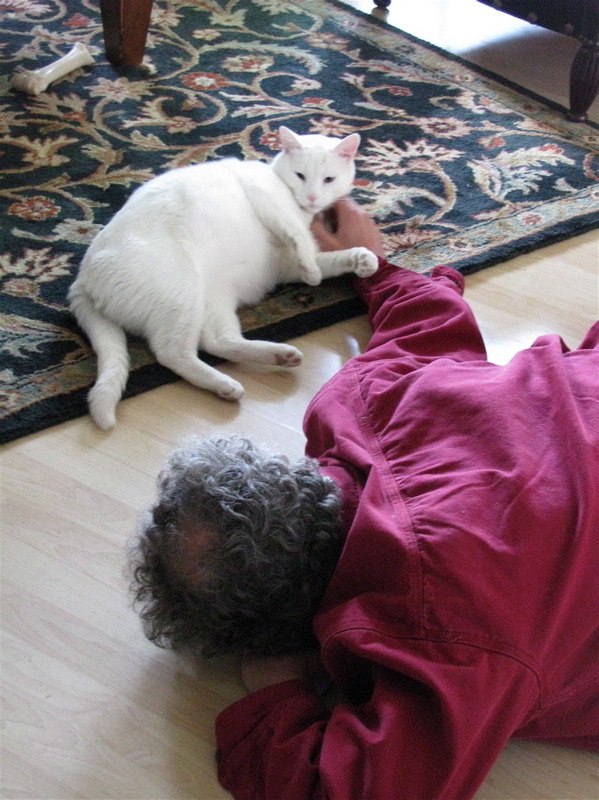 He & I spent some time yesterday establishing who was in charge, and what behaviors were good or not allowed- such as rushing the cats in curiosity, jumping, and when to break a sit/stay. 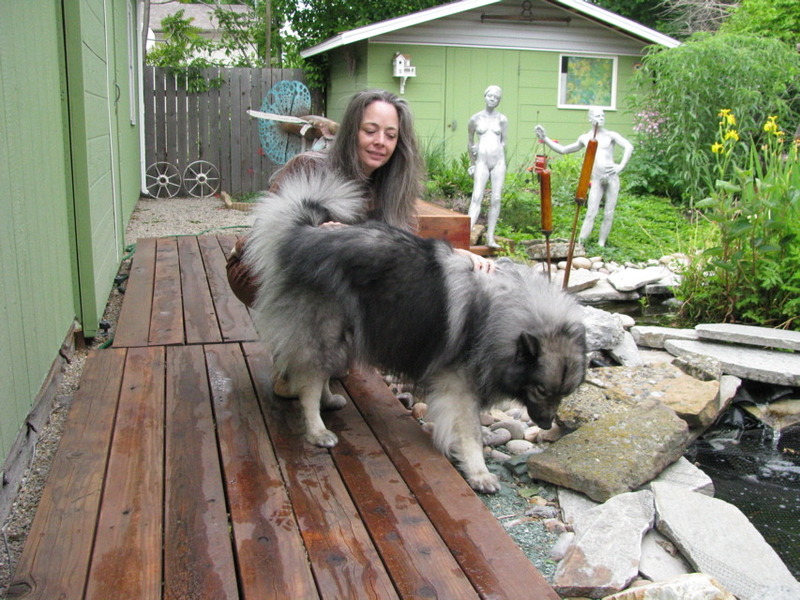 He learned hand signals for sit, down, stay, and come in one quick session (he knew verbal “sit” before, and was a bit muddy on the rest). 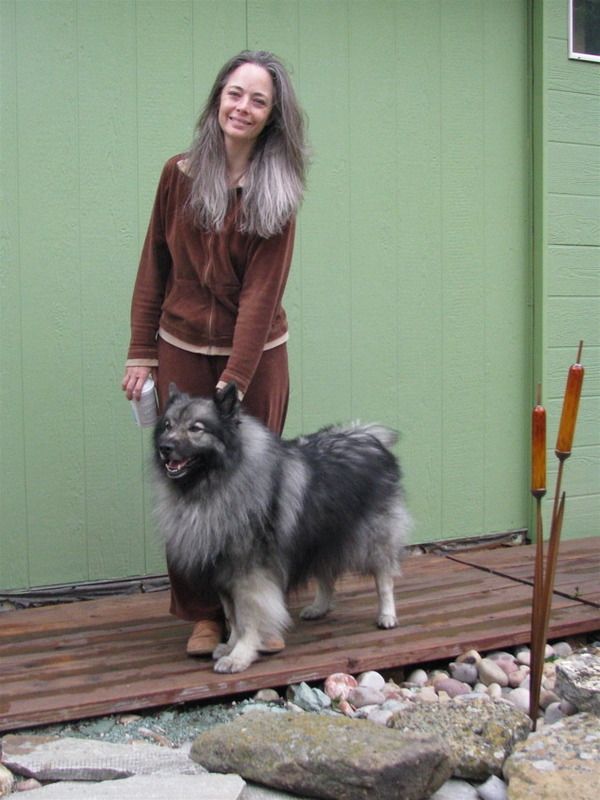 If I’m working him in the yard he will heel to L and sit properly when we stop, but out on walkies he was never trained to heel and was walked from the R side. Altering this will take a bit of work. He is well behaved on walkies though, and responds immediatley to any vocal command. Quite a smart little fellow that loves to learn and respond. 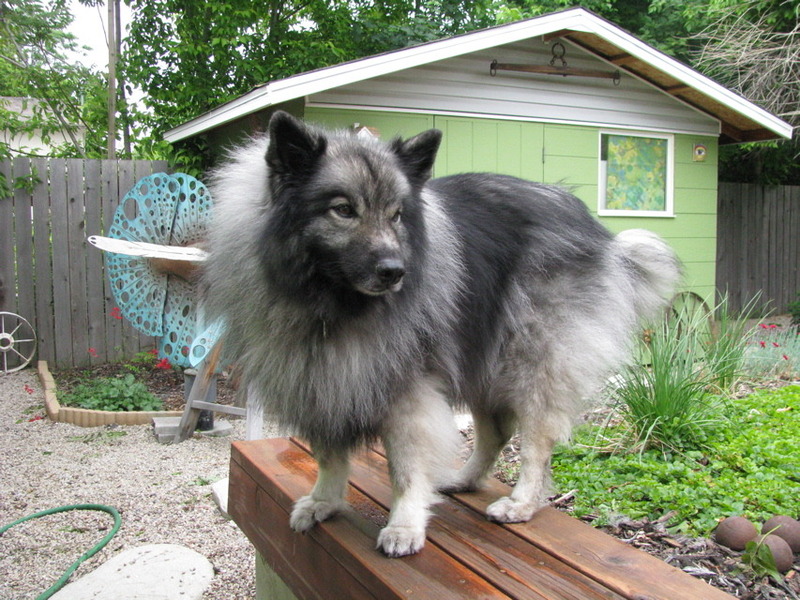 I may have to set up an agility course in the yard to keep him interested, once we get all the basics nailed down. This afternoon saw the beginning of a cat house of sorts. 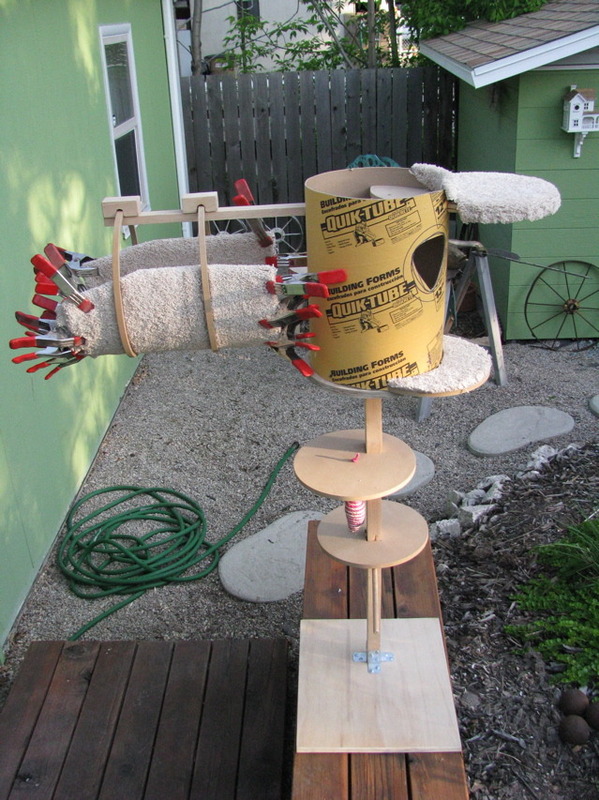 It has a hanging basket, a turret, a lookout post; we’ll see what tomorrow adds. 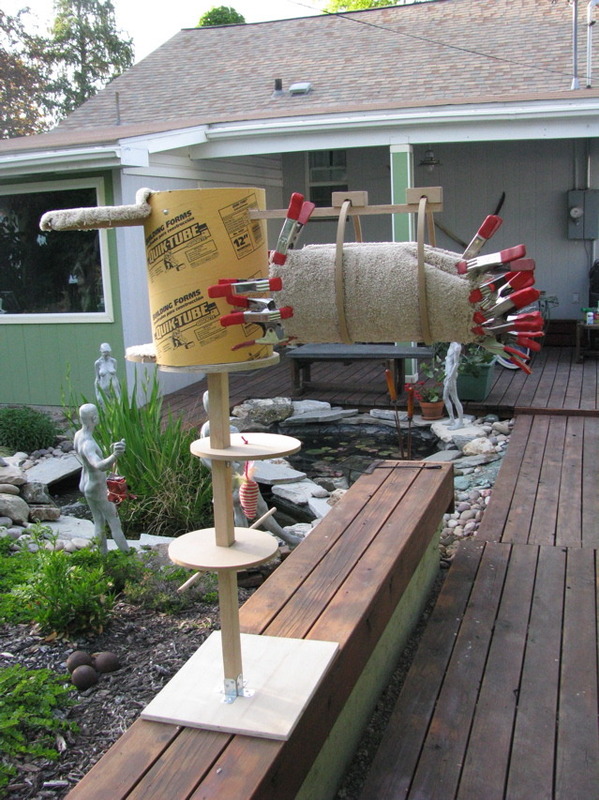 The clamps are holding the carpeted hanging basket while the glue dries overnight. E & I wound up at our local salvage shop, George’s Alternative Uses Architectural Salvage, and George knew exactly what we were looking for and all the functional issues of returning the door to its original look. The doors are original to the house, and had 70 years of paint to prove it. I spent yesterday sanding through driplines of 6 colors (blue, olive green, apple green, mist green, pink, white), but mostly flattening out the roller texture of the last layer of white and adding bondo to rebuild corners and dings. A primer coat of Kilz and a coat of white enamel and I was out of paint. It still could use one more coat of enamel. 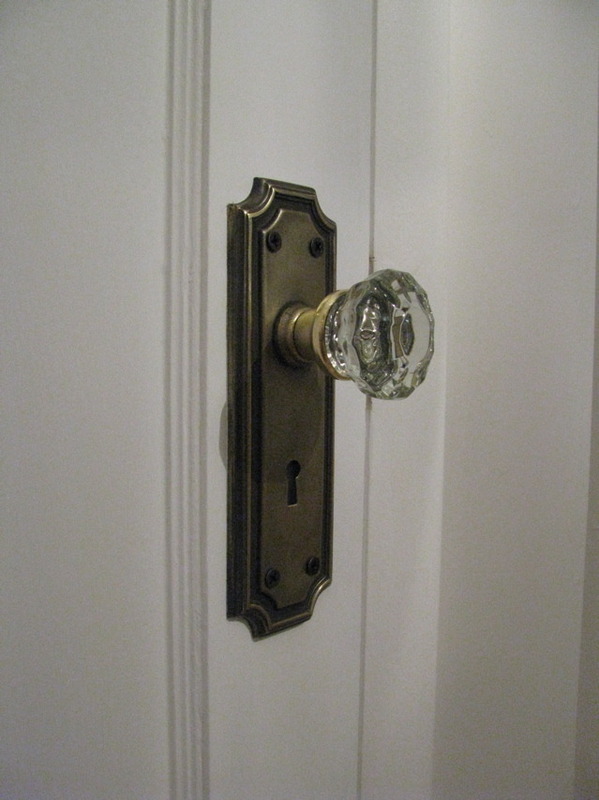 This was the door to the bath picured in the previous post that was gross-out-yellow. 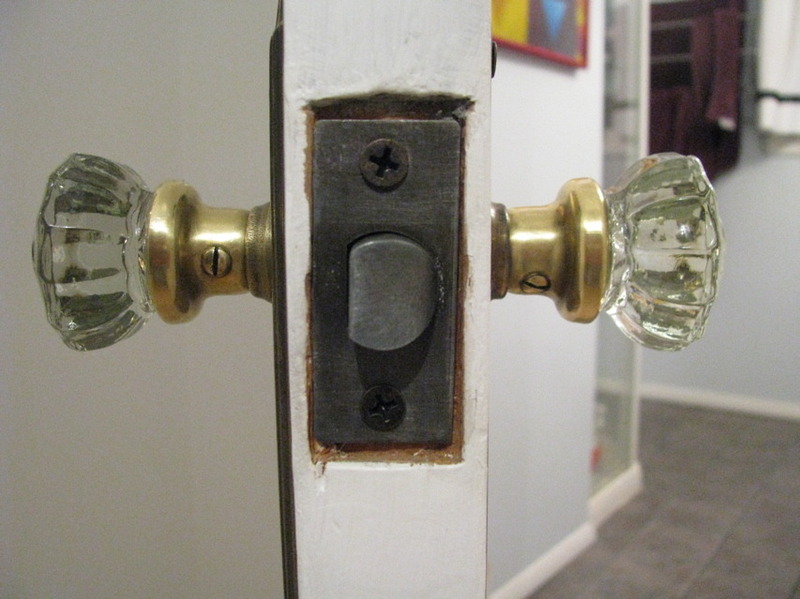 The glass handles came slathered in layers of paint, with the brass fittings painted and tarnished and stained. The door plates were also painted, and entirely blackened with age. I spent the last 4 hours getting the handles clean and shiney, then cleaning off the paint on the plates, buffing them back with scotch-brite pads, then 00 guage steel wool. 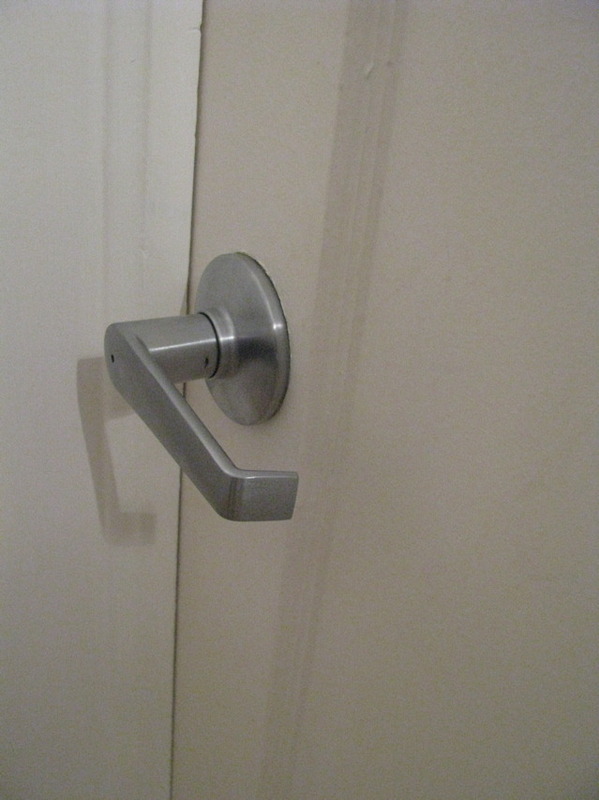 The goofy handycap accessible universal design doorhandles they replace have a 2″ bore straight through the door, the vintage handles only needed an inch at most. So that was a structural issue to fix, but that is where a shop full of tools comes in handy- the longest setback was driving back to Home Depot for matching aged brass screws. E made rhubarb home-made syrup & rhubarb waffles for breakfast, and a gourmet lasagne for dinner- so it was a good Hobbit day for fiddling with old treasures. 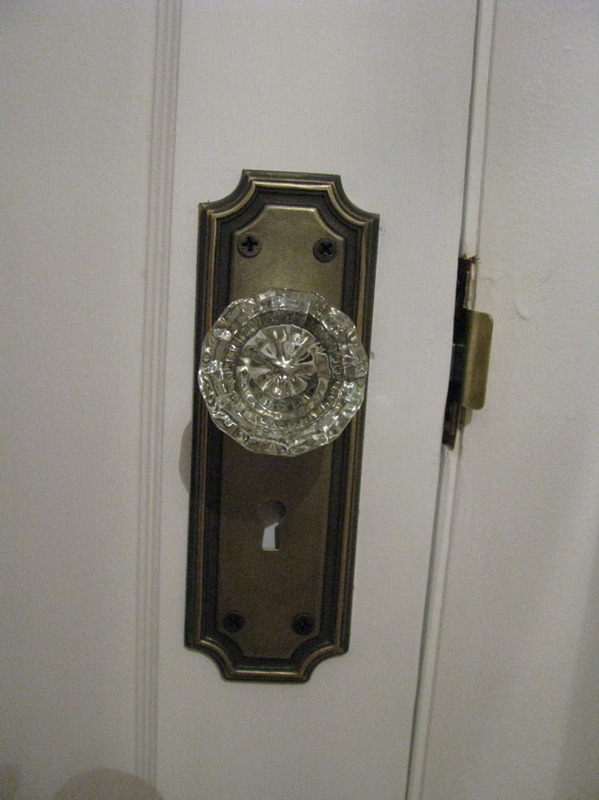 There were two sets of doorknobs, the other set was fused together (maybe they cut the door apart to get the handles off?) and I let it sit with w-D40 overnight. No difference. So I took it out into the shop and started fiddling around. The trick is not shattering the glass or shredding the brass, but applying twisting force. I heated up a side and got a vice-grip plier on the center rod, then put a bolt in the tightening eye for the handle and used that for leverage. The bolt bent but I finally got a micro-turn. I removed the bolt and saw that any more force in that manner would balloon out the soft brass sidewall. I re-threaded the hole, and the set-screw had just enough left to grab on- so I hadn’t ruined it! The wrench had slipped and bit into the brass- dang. So I went for a small pipe wrench, and with some monkey-strength the knob slowly let go and spun off. I cleaned out the knob and it spun back on and off easily. The othe side was still fused in place, so I tried the same thing. No budge. 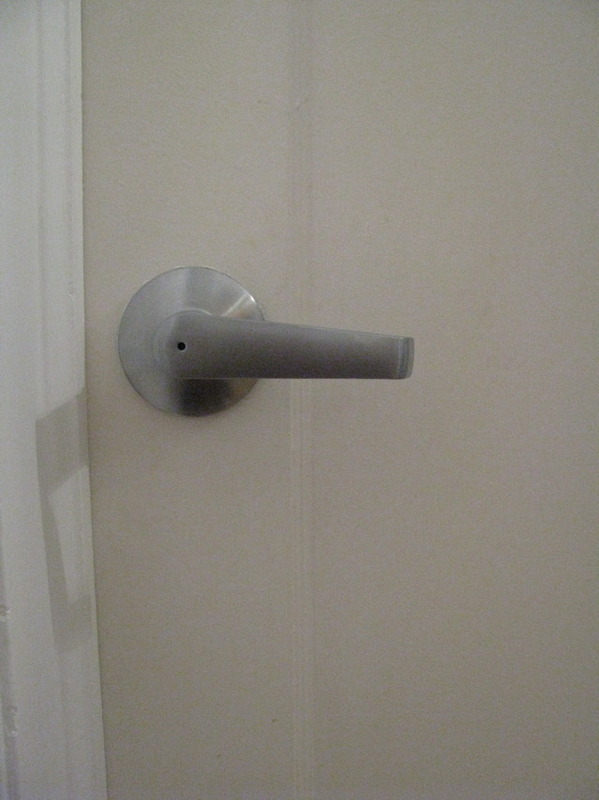 So I tried some monkey-strength, and things started to spin, then the steel shaft sheared off inside the handle. The spin had been the steel shaft twisting. I killed it. That is a stubborn old handle that would rather just die than ever work again. 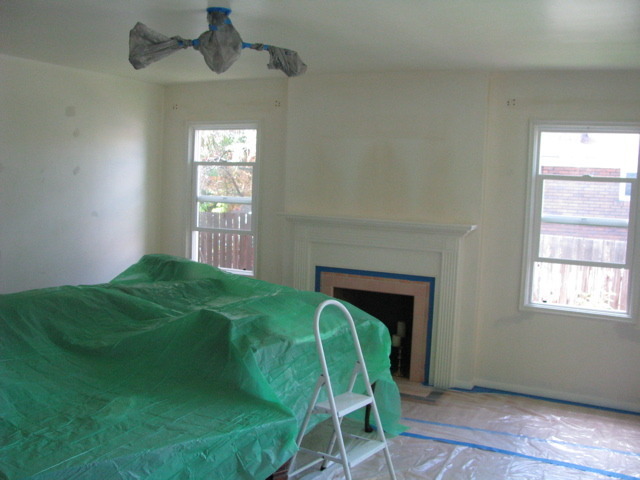 The semester ended last week, leaving me no excuses with continuing my repainting of the house. 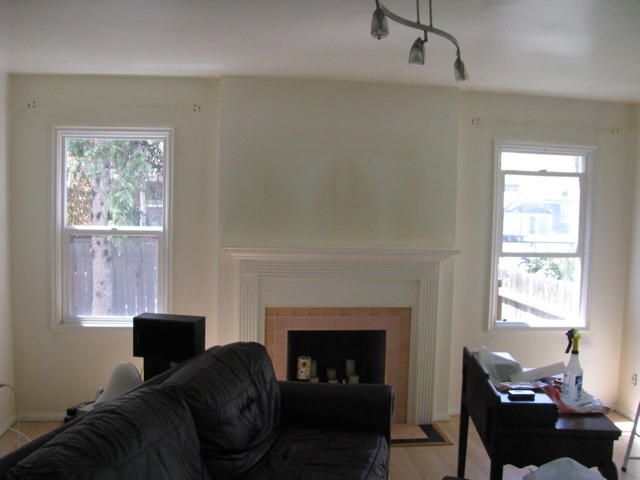 The before pictures show the effects of only 4 years of smokers living in the house- they had painted it all white, over the previous Yikes-Green. 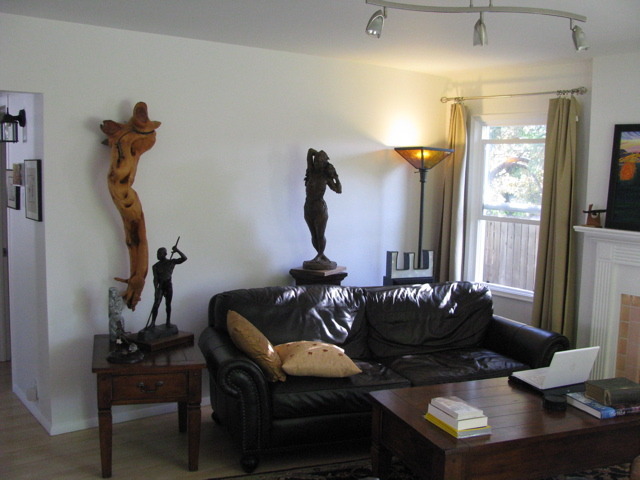 Over Xmas I refinished the dining area (which just had a hole punched in the wall by an Elizabeth-boobie-trapped sculpture that drew a long scrape down my arm and crushed my foot: feels kinda broken…it was the last thing to move back into the living room, of course). On Sunday I got things started by takining down the curtains, pulling off all the socket covers, and moving everyting out of the room. Then I spent the day plastering 70-year old house issues, and caulking every seam of every window, the floorboards, and the fireplace. 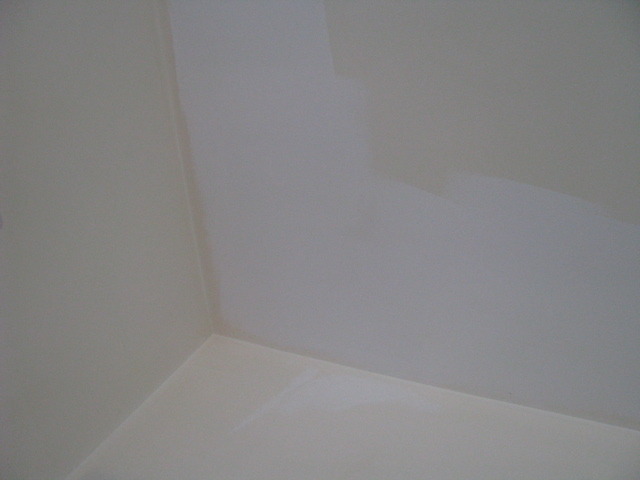 The caulk was a special firm variety that holds and doesn’t bulge or run, but was nearly impossible to squeeze out of the caulk-gun, that or married life has really ruined my hand strength.E spent a lot of the day washing down the walls, again. an 8 hour day. 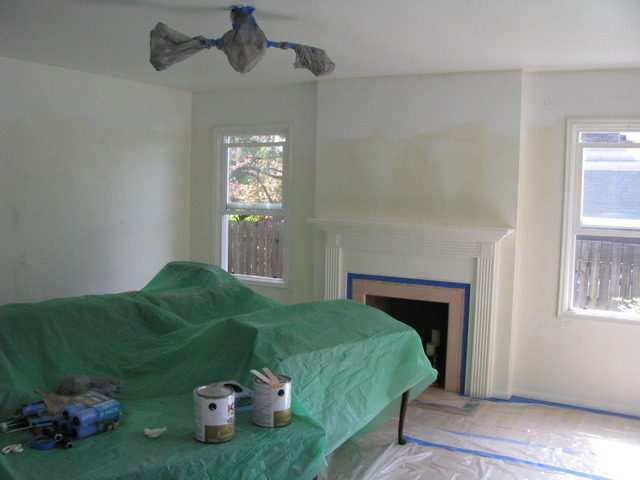 Monday I blue-taped around all the floorboards, then taped down drop cloths. Then taped off the lights and everything else. 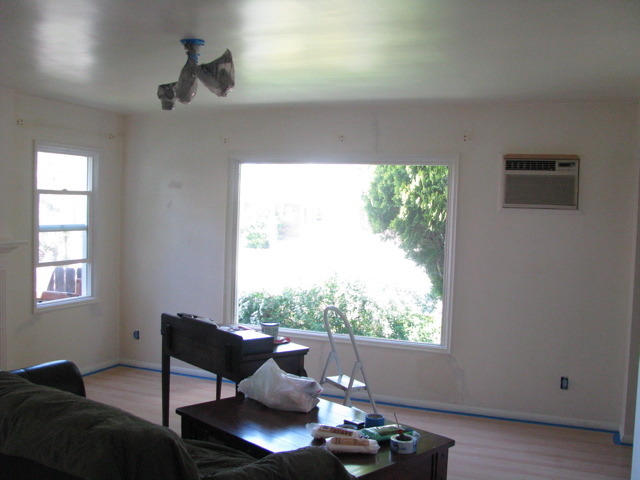 Then it was time for paint job #1, covering ceiling and walls with at least one coat of Kilz to knock back and seal in the cigarette sallowness. 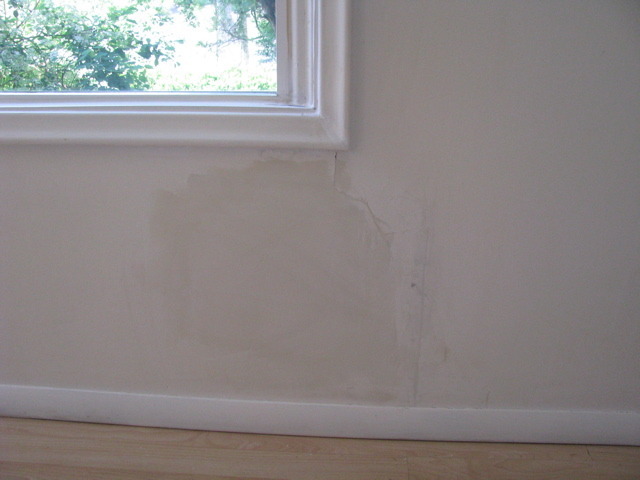 Some areas took 4 coats of Kilz. a ten hour day. 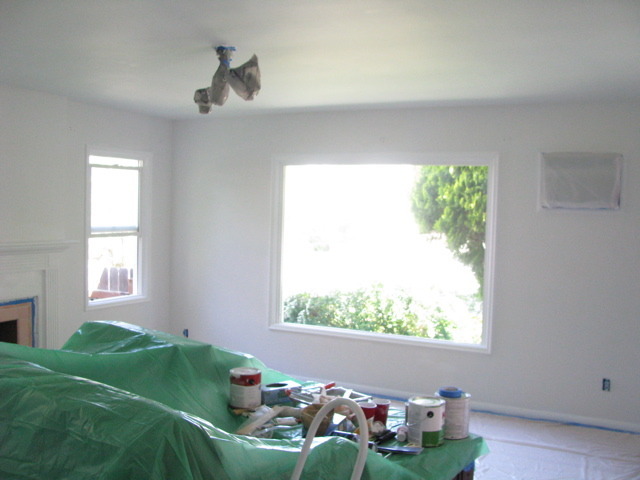 Tuesday I painted the ceiling a flat off-white with a blue tint, the same as the dining room. A hint of blue in the ceiling gives a nice sense of space overhead. The first step is using a trim brush to define the line of the ceiling/wall, a bit of zen displacement helps the hours of fidgeting this requires- then a rollerbrush on an extension arm. It is good to wear a hat for this part. a 12 hour day. 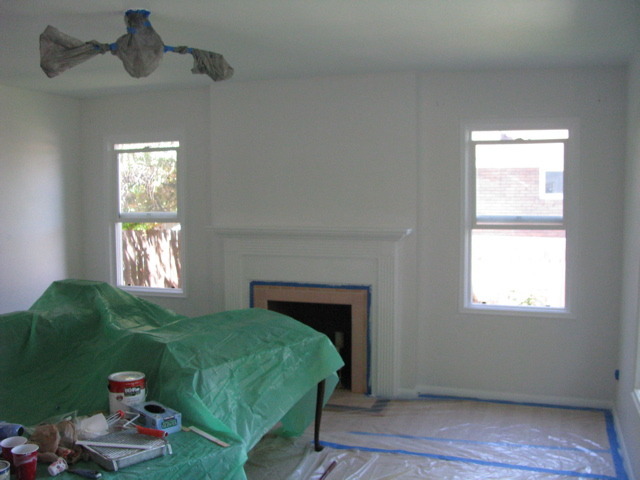 Wednesday began giving all the trim, floorboards, windows, and fireplace two coats of white enamel. 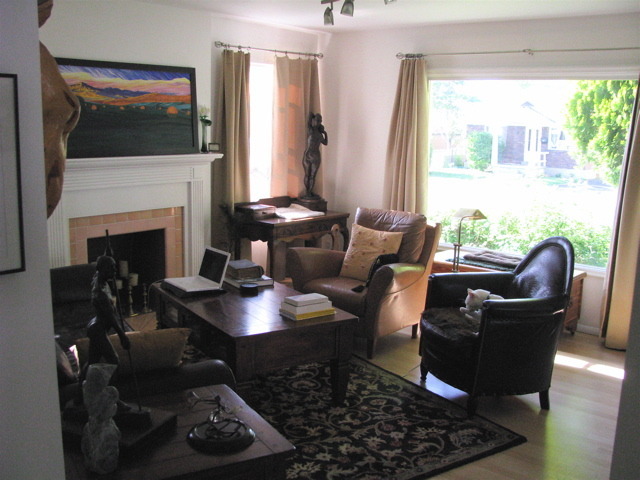 Then it was back up on the footstool for more zen trim brush, defining the line of the wall from the ceiling, the wall from the floorboards, and around all the windows and fireplace. 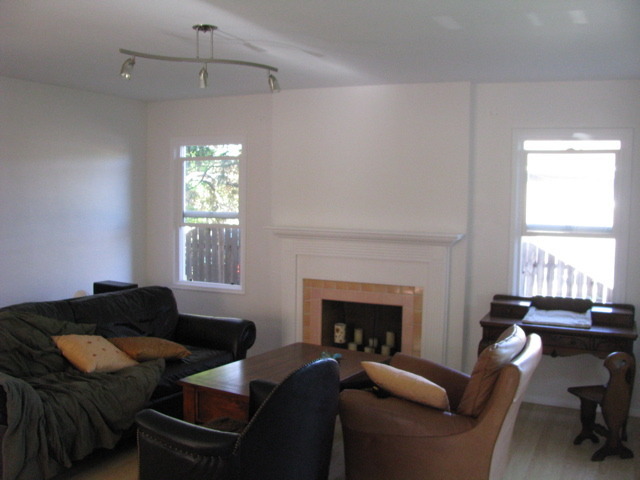 The wall color is a warm toned off-white. 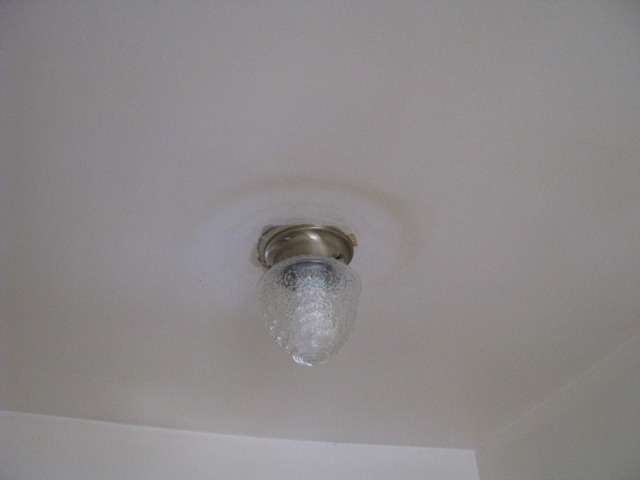 In the right light it has a buff sandy quality, but usually reads as white in daylight. a 12 hour day- that’s a 40 hour work week. whew! 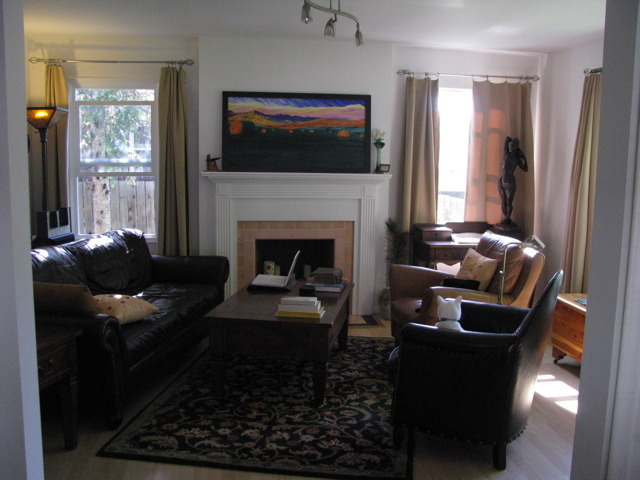 In one of the later picts you can see a yellow door (it doesn’t seem yellow in the before picture). My next project is to remove all the doors and take them out to the shop, sand off years of paint and bondo over dings, then paint them all and rehang them.